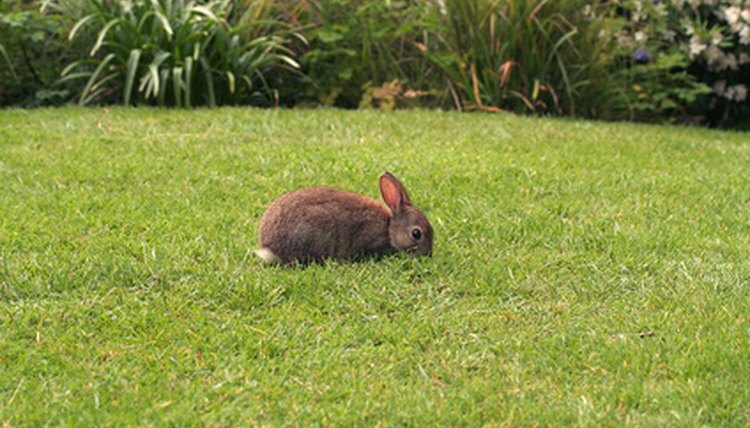 Whether you are trying to recreate a rabbit's natural ecosystem for your pet or ensure that your back yard is ideal for rabbits, it is important to understand what they need. Rabbits have certain needs in their living environment that will keep them happy and healthy. Like all living things, rabbits have the basic need for food, water and shelter. They are more likely to live and thrive in areas that offer all of these items. While living in the wild, it is common for predators to live on the natural food chain. Rabbits, as well as other animals, will live in areas where the threat of predators is less. Rabbits are happy on the ground, but depending on the breed of the rabbit, they thrive in areas of forestry, desert or wetland. Some rabbits live in nests that are built above ground, while others choose to dig holes and live in burrows. All rabbits require plants and other forestry to eat and live. They eat seeds, grass, shrubs and twigs. Because their all-plant diet is hard to digest, rabbits have also been known to eat their own feces. This helps them redigest food high in cellulose, which is found in plant matter.